Fenwal Thermoswitches, Detect-a-fire, & Digital Controls. Partlow Temperature controls, and Recorders. Toho low Cost Easy to operate Temperature Controls. PID Autotuning provides easy first time set-up. FuzzyLogic control learns your process. Standard 8 Segment Ramp Soak feature. Dual Output for Heat / Cool Control. NEMA 4X For Harsh Enviroments. Bright Easy to read LED Digits. Fuji PXW Series Controllers display both setpoint and Process Temperatures. 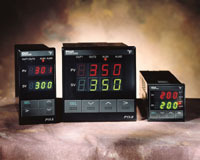 Fuji PXY Series Controllers display only One Variable at a time. Call us for Application Assistance.